So got your GR already and you’re jonesing to take it out for walk and do some street photography already. You’ve heard all the hoopla about the Ricoh legacy and you want to confirm what’s the hype all about. Well, in today’s installment of my user based review of the Ricoh GR I’m going to explain a way to use an option which may not be that apparent ― FA/Move Target(from now mentioned as FAMT) and how this feature may be an aid for your new street photography adventures. This particular mode is explained on page 56-47 of the Ricoh GR manual (download here) and I reproduced both pages for your convenience below. So what’s FAMT? FAMT is a feature which helps you focus on objects and scenes. I have mine setup via a Fn1 to quickly toggle it. In short, it adds a virtual moveable area the size of a square on your LCD which can be enlarged to a maximum of the full LCD and can be shifted top, right, bottom, or left. 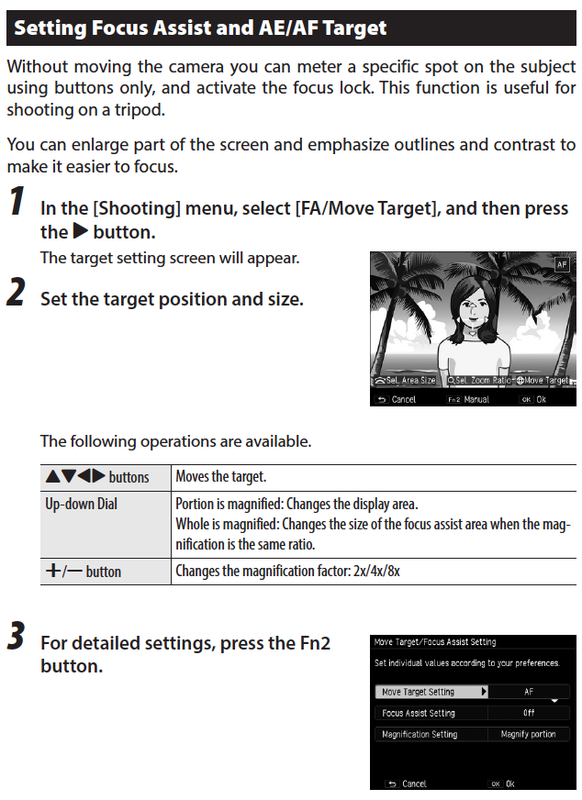 It has three options as seen below on #3 ― Move Target Setting which says AF I enter and selected AE-AF for Auto Exposure and Auto Focus. On the next option, Focus Assist setting, you have 4 options and Magnification Setting which has two options ― Magnify Partial or Whole. 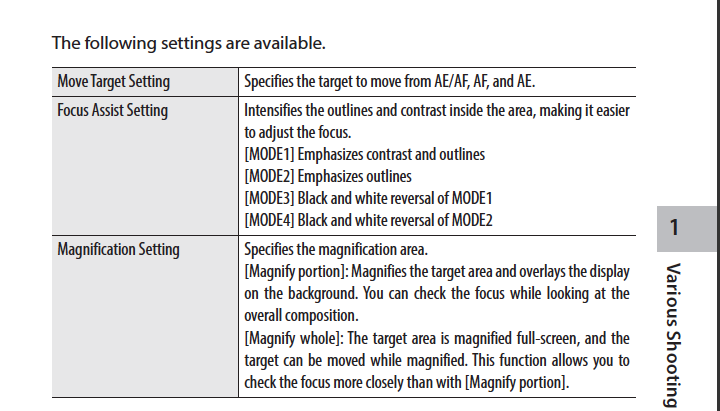 Let’s “focus” on the Focus Assist Setting, as you can see below it has 4 modes and you can experiment with them to your heart’s content but I’ll focus on Mode 2 and how I use it on a day to day basis for my photography. From here you can experiment and choose your favorite. I have my LCD set to color when I shoot (sometimes). I click Fn1 and it brings up the little square which you can enlarge and move around. I basically leave mine in the center of the frame and enlarge to a nice size, about 2.5 times more than the initial square. At this point I have a large grayish square in the middle of the frame and like the instructions says it enhances the outlines of our subjects. Let me rewind back to Magnification setting, I choose whole. Why? Well, because if I choose partial, the area I just selected, the now big grayish square on my LCD, will just look normal, a grayish square in the middle of the color LCD but if I were to choose partial, it will literally zoom in on the square magnifying what’s in the square visually and take over your LCD with that portion and that’s no help for our street photography. So now picture my LCD with a greyish square in the middle, better yet, follow along with your GR. Picture yourself on a photowalk during the day, its sunny, and hard to see the screen not literally because its sunny (its highly viewable outside) but because your GR in either above your head, arms extended, or at your waist level and your angle of view is severely restricted. Well, in comes FAMT to rescue. For the sample shot I literally held the camera with both hands, you know the infamous and sometimes dreaded point and shoot look, you know the type, both hands up front and viewing the LCD but raise above your head and arm extended as if you were photographing something above and beyond you’re incoming subject. Basically who ever is watching is going to think you’re photographing something that is higher than them a building, a tree, whatever, its just above their heads or just up there, hence your arms extended, all looking like a rookie and they are not concerned with you because they don’t like the subject of your photograph. 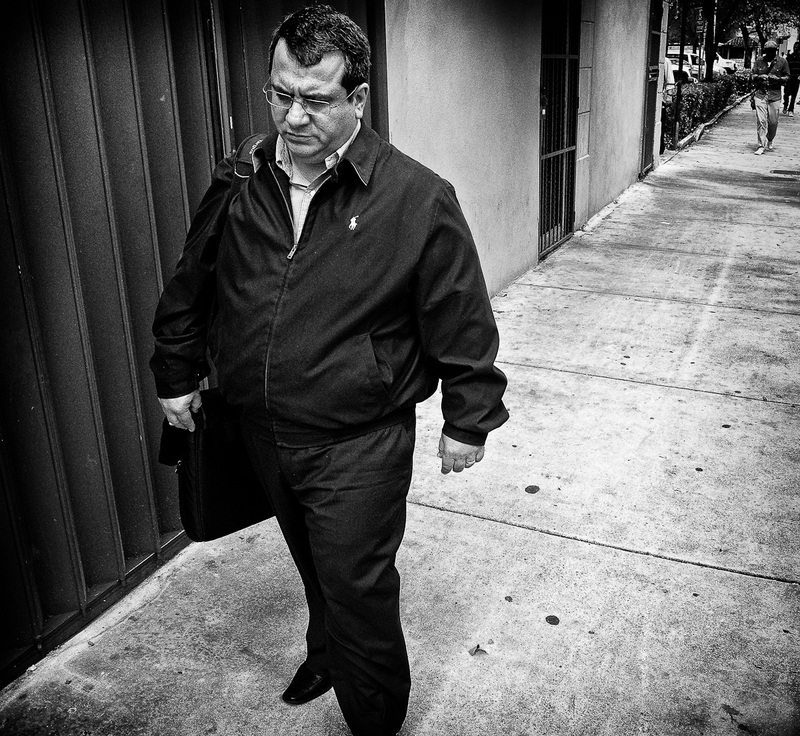 Little do they know your a serious street photographer with the king of the streets ― the GR. Once you have your arms extended and you can view your whole LCD and playing the part of an innocent snap shooter and your subject is quickly approaching you (and discarded you by now) and when they step within the desired range, you quickly flip the angle of the camera downward and now the LCD is not in sight but with the FAMT on you’ll be able to see the grayish square and frame accordingly and capture your image like a professional. My subject had no idea and in the spirit of Capa I was right there. A little BTS (behind the scenes) talk. I had spotted him about 40 feet ahead of me and he looked semi tired, pensive, not all there, and I thought it would make an interesting photograph. If you have any questions, don’t hesitate to ask in the comments. If you follow this tutorial in no time you’ll be on your way to making better images while out on the streets from various perspectives. Stay tuned for the next installment of my Street Photography tutorial series. Jorge: What are the settings on your GR? I’m also unclear about zone focusing, manual focusing, and snap focusing. Snap has preset distances? Changing distances in manual focus is unclear – no wheel or dial. Perhaps I need to read the manual more closely – it’s not intuitive or easy like peer cameras. Once I understand the techniques, I suspect this’ll become my favorite camera. John, for sure, you would benefit from reading the manual. I read it and trust me, even with prior experience from the GRD3/4 I still find interesting tidbits I was not aware of. Once you get a grasp of these basic commands you’ll be on your way. Good luck with the GR. First of all, Jorge – wonderful photos! I love them all, especially the jazz player! I’m curious about your general street photography approach (most of your subjects don’t appear to have known they were photographed, which, I believe, is the way to go. How do you accomplish this? Shoot from the chest or the hip? You mentioned shooting from above, arms raised (interesting technique). In other words, do you frame your shots or do you chance it? Also, do you pre-focus / zone focus? What are your parameter settings – auto ISO or fixed ISO, f-stop (f/8), auto speed or fixed speed? I believe pre-setting parameters (focus and metering) is best, but what’s best? BTW, here’s an interesting thought I learned recently. My hero, Cartier-Bresson either posed his subjects or they knew he was photographing them…look at his contact sheets! Many different takes, and he selected the best. So much for the decisive moment! Thanks for the kind words John. Yeah, the jazz man is one of my favorite even though I shot it recently, just something about that frame, I don’t know, it just captures you. Street photography for me is about instinct and trusting them wholeheartedly. You’re correct, most subjects don’t realize they are part of my frames and that’s the way I like it. Unless of course, I’m actively engaging in a conversation with them about whatever and I ask them for a portrait. Do I shoot from the check or from the hip? With the GR, I shoot in many ways. I wouldn’t call it “off the hip” because after shooting a with some form of Ricoh GR Digital camera for 3 years beginning with the GRD3, then GRD4, and now the GR, that form factor has metamorphosed into an extension of my hands and thus vision but only after a lot of practice John. I can no take a shot backhanded, over the head (like in the tutorial), sideways, it doesn’t matter because I know my screen and how to work the angles I’m shooting. On a dslr is a bit different and today I actually shot strait into my subjects, right in your face, and most of them often look back, as if I was photographing something behind them, its truly funny to see those scenes unfold. Pre-focus/Zone, nope, straight AF even on the GR. I’ve barely used the snap focus feature on the GR just because its so darn fast and I often times don’t need it as I know what I want to shoot and its a coincidence or a reaction to something that caught my eye and I just don’t have time, know what I mean. I know right HCB and the whole “Moment Decisif” but such is a photography, its hard to be a ninja and not be seen, all you can do is mix in with the scene and practice, practice, practice your technique with your gear so you can make the most out of that combination ― scene(situation) and gear. Some other bloggers often espouse this whole zen feeling as they photograph and the implications of this and that, and top 10 list of things they’ve learned from so and so master, please give me a break. Its a vain attempt to for cheap publicity. Go and out shoot, shoot a lot, share a lot, and then talk. Let the images speak for themselves. Let the images create that emotion, document interesting subjects, and be merry. This whole notion of sharing less is more its ridiculous and now even more so with digital. I share what I like, I share a lot, as you can see from my blog, and let the chips fall where they may. Some folks are bound to hate my style, what I photography. For others, it may show them a different perspective or insight into a new technique or theory, some will love it but primarily I shoot for myself. I’m my number one fan. It pleases me to photograph. Its therapeutic and I don’t pretend to have all the answers and best way of this or that. I just photograph and document what I see and like Daido says “my desire.” In my opinion, Daido is even more out there than HCB ever was, “there you go, I said it, somebody had to say it,” but he’ll never get that credit. Thanks for this – i have one question since im still using LR3 + Silver Efex. Are the GR files working with LR3 or do we have to upgrade to LR4 soon ? I dont want to upgrade to be honest if I can still use LR3. I’m on Lightroom 3 still. So, nope you’re good. Cool, remember that the Ricoh GR and cameras like the Pentax K5 IIS record there in digital negative format aka RAW files as dng’s. So most serious photo management application will support it. Know having a specific lens profile is something different altogether. Nice tutorial. The camera is almost *too* customizable. For now I’m keeping things simple using the Fn2 to switch between AF/snap and Fn1 to set snap focus distance. Probably my imagination, or me not understanding the camera, but it seems just a tiny bit faster that way when it’s explicitly in snap focus mode, versus AF and “Full Press Snap”. Thanks, I know exactly what you mean. You’re doing fine with those settings, I have a profile saved with those exact settings as well but I’m still in the same process as you getting to know it in depth. If you shot with the previous GRD 3/4 then you have some background but it also more extensive than the previous models. The more the merrier it just means more people will have their own and eat it. Cheers!